Sometimes people take forever to read a book. It's like they only read one page per day, or maybe even just one word. You borrow someone a really good book, yet it takes them a millennium to read it. It's like they are on the setting of "glacier" for reading speed. In cases such as these, perhaps they would read faster if they had a fun tool to use when they were done! 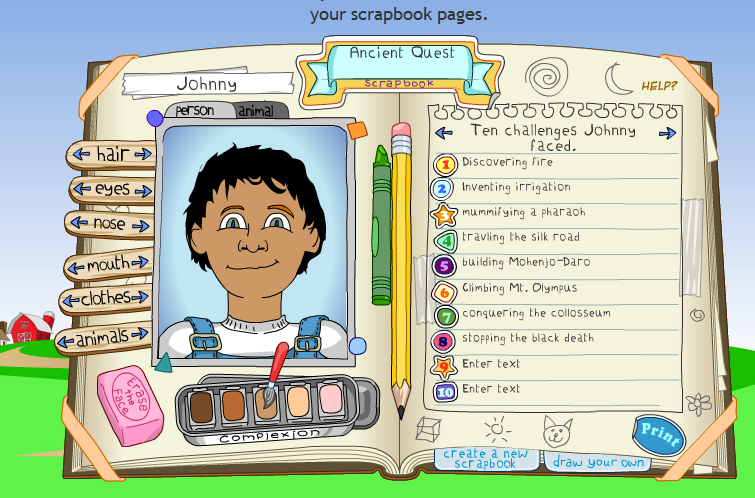 Scholastic provides a nice character scrapbook tool for kids to use in focusing on a character from a story or an individual from history. Though it may appear as if this tool is designed more for elementary students with its cartoonish appearance, students of all ages could use the tool to help them detail a character or show you what they know about a particular character or person. They could use this tool as a learning opportunity or as a review. With the tool, students can show what the character looks like (or as close as possible) and then provide facts and details about the character. Information that students enter about the character: things I know about the character, things about their personality, words that describe them, appearance, challenges faced, and accomplishments. With the finished product, students have the option of printing it. This however, is not the most efficient way of doing things, so I would recommend teaching the students how to do a screen shot and email it/save it in apps drive/save it in Google Drive, etc.